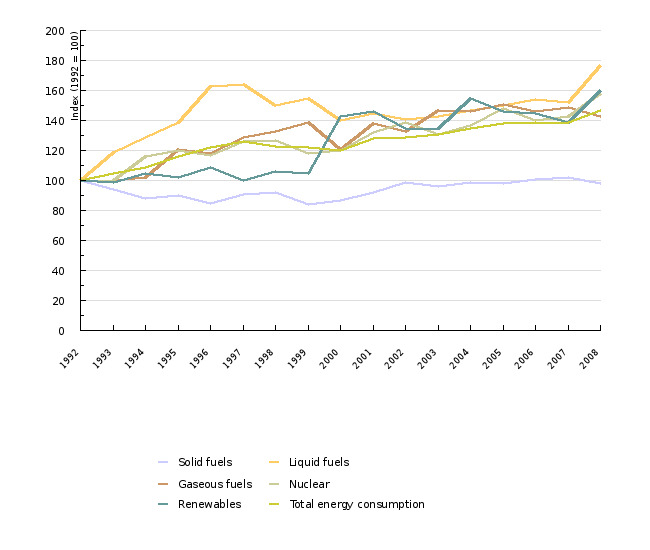 In 2008, total energy consumption increased significantly more than the average during the period 1992-2008. The share of liquid fuels was the highest, followed by solid fuels, nuclear energy, gaseous fuels and renewable energy sources. 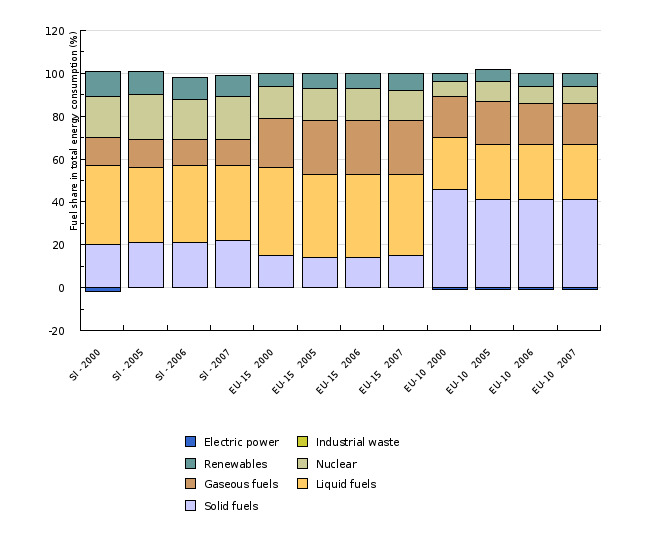 In 2008, the shares of liquid fuels, nuclear energy and renewable energy sources increased. Total energy consumption in Slovenia was higher than in the EU-15. Total energy consumption (sometimes also referred to as energy supply) is the amount of energy necessary to satisfy the energy needs of a country. It is calculated as the sum of the total energy consumption in the form of solid, liquid, gaseous, nuclear fuels and renewable energy sources and the net import of electricity. Statistical Office of the Republic of Slovenia, 2009; Jožef Stefan Institute, 2009. Eurostat, 2009; Jožef Stefan Institute, 2009. - 20 % energy saving in 2020 at the EU level with regard to the scenario of »business as usual«. The data on total energy consumption by fuel with regard to different environmental impacts of fuels enable an assessment of the environmental impact of energy consumption. The use of fossil fuels causes greenhouse gas emissions and air pollutants, whereby the emissions are significantly lower in the use of natural gas than in the use of coal. Furthermore, the production and transport of fossil fuels is an important pollution element of the environment. The use of fossil fuels is also limited with supplies. On the other hand, the nuclear energy use does not cause greenhouse gas emissions and air pollutants; however, it is problematic due to nuclear waste. The use of renewable energy sources is the least harmful for the environment with regard to emissions; however, the consumption of this energy can still affect an ecosystem or landscape. As a result, the consumption of any energy influences the environment. The reduction of the impact is possible with a change of the share of fuels and, primarily, by lower energy consumption. Total energy consumption in 2008 amounted to 7,749 ktoe. In comparison with 2007, it increased by 5.6 %, which is significantly more than the average annual growth during the period 1992-2008, when it increased by 2.4 % annually, and more than the average annual growth after 2000, when the average annual growth was 2.5 %. In the structure of total energy consumption in 2008, liquid fuels prevailed (37 %), followed by solid fuels (20 %), nuclear energy (21 %), gaseous fuels (13 %) and renewable energy sources (RES) (11 %). The net import of energy represented -2 % (more energy was exported than imported) of total consumption. The use of fossil fuels increased by 15 % in the 1992-2000 period. This is largely due to an increase in the use of liquid fuels, followed by an increase in the use of gaseous fuels; the use of solid fuels had significantly reduced on account of the cessation of the use of coal in final consumption sectors. The nuclear energy use increased by 20 %, and the use of renewable energy sources by 43 %, primarily on account of the new assessment of the use of wood biomass in households. The total energy consumption increased by 20 %. 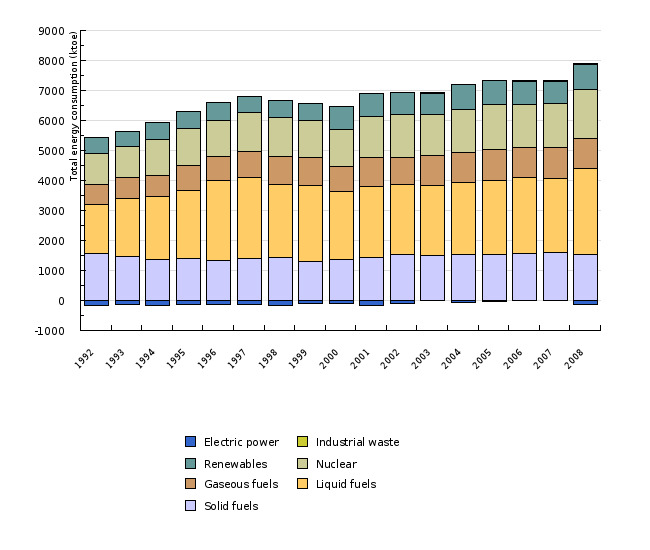 In 2008, the use of all fuels, including nuclear energy and renewable energy sources, was higher with regard to 2000. The use of fossil fuels increased by 20 %, which is largely due to liquid fuels, which contributed almost two thirds of the total use, followed by solid and gaseous fuels almost in an equal share. The nuclear energy use increased by 32 %, primarily due to new evaporators, other technical improvements and a year without repairs. A favourable hydrologic year has by far influenced the increased use of renewable energy sources the most, which increased by 12 %. The total energy consumption increased by 22 %. The most important renewable energy sources in Slovenia are hydropower and wood biomass. Since the consumption of wood biomass in households is only estimated, it is impossible to follow the trends of use of wood biomass in households. In industry, the data on the use of wood biomass are obtained on the basis of questionnaires, while the use of hydropower on the basis of the generated electricity. The capacities for electricity generation from hydropower increased in the period 1992-2008; however, the production is dependant also on the river stage. Other renewable energy sources (biogas, solar energy, etc.) have only a small share. Due to differences in the growth of the use of individual fuels, shares in the total energy consumption changed as well. In 2008, the share of liquid fuels, with regard to 2000, was higher by 1 percentage point, and with regard to 1992 by 6 percentage points. Nuclear energy also increased its share by 1 percentage point with regard to 2000 and 1992. Gaseous fuels have the same share in all three years. In 2008, the share of renewable energy sources decreased by 1 percentage point with regard to 2000 (data on the use of RES before 2000 are not comparable with the data after this year – see indicator EN18). The share of solid fuels decreased with regard to 2000 and 1992, which is positive, since they are the biggest pollutant of the environment. They are used only in the generation of electricity and heat as well as in the industrial sector (paper and pulp industry, concrete production). In 2008, more encouraging trends can be noticed in renewable energy sources with regard to the previous year; on the other hand, trends for liquid fuels are more problematic, since in 2008 their use significantly increased after a decrease in 2007. Due to changes in the share of fuels in the total energy consumption, the CO2 intensity in the total energy consumption is changing as well, which influences the total CO2 emissions. The structure of the total energy consumption did not essentially change in the past; moreover, the consumption increased. The consequence is that the emissions of energy sources in the period 1992-2007 increased by 23 %. In the structure of the total energy consumption, bigger changes are expected in wider consumption towards a reduced impact on the environment and lower CO2 emissions due to future technological improvements in the transformation sector, which will also include a replacement of fuels (gas units in the Šoštanj thermal power plant were constructed in 2008, while additional gas units are planned in other locations as well as a new coal block in Šoštanj) and the continuation of the trend of replacing liquid fuels with gaseous fuels and wood biomass. In the period 2000-2007, the growth of the total energy consumption in the EU-15 was 0.5 %, which is 1.4 percentage points less than in Slovenia. In 2007, the growth was negative in the EU-15 (–1.2 %), while in Slovenia it amounted to 0.2 %. In the structure of the total energy consumption in the EU-15, the share of liquid fuels is bigger than in Slovenia; namely, 38 % (in 2008, Slovenia strongly closed in on this share). The share of gaseous fuels is also significantly bigger (25 %), while the shares of nuclear energy (14 %), solid fuels (15 %) and renewable energy sources (8 %) are smaller. In the comparison of the trends of shares of fuels, the decrease in the share of RES is most striking, since in the EU-15 and EU-10 this share is increasing. The total energy consumption provides us with a review of the energy consumption in the country. It is influenced by the entire legislative spectrum from the area of energy (efficient energy consumption, renewable energy sources, etc.) and the reduction of greenhouse gas emissions (emissions trading) and air pollutants (threshold concentration of emissions for individual equipment). Since the objectives of policies in the indicated areas are directed towards a reduction of the impact of energy on the environment, larger structural changes towards an increase in the use of natural gas, renewable energy sources and higher efficiency of energy consumption are expected in the future. The last package of EU regulations in the area of energy and climate change, which was adopted in 2008, also alluded to that. Objectives summarised by: Resolucija o Nacionalnem programu varstva okolja 2005-2012 (ReNPVO, Resolution on National Environmental Action Plan 2005-2012, Official Gazette of the RS, No. 2/06) and the proposal of the climate-energy package. Source database or source: SI-STAT and Eurostat. Data administrator: Statistical Office of the Republic of Slovenia (Mojca Suvorov) and EUROSTAT. 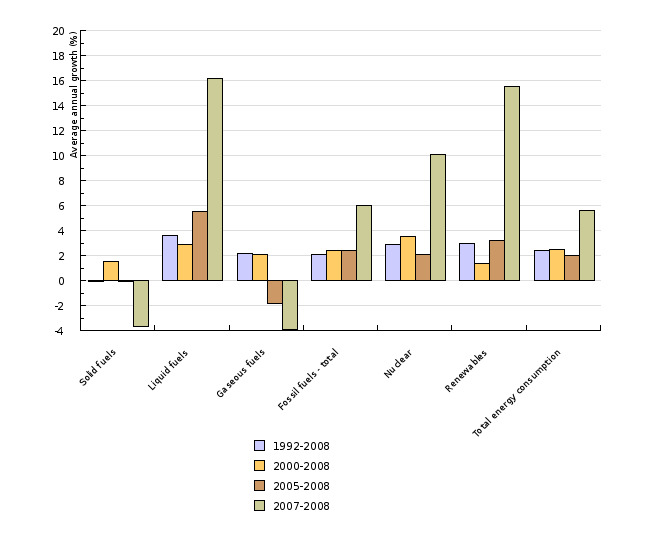 Methodology and frequency of data collection for the indicator: The data for the period 1992-1999 were calculated on the basis of data on the use of fuels in material units, which SORS communicated to EUROSTAT in the form of a Joint Annual Questionnaire, and data on calorific values for individual fuels, which were obtained in a joint questionnaire (solid fuels, gaseous fuels) and the SI-STAT Data Portal of the SORS (liquid fuels). For the period 2000-2008, the data of SORS were used; the data were also published on the SI-STAT Data Portal and were published on 25 September. The data Energy supply from the energy balance of Slovenia were used for the indicator. For the comparison of data for Slovenia with the EU data, EUROSTAT's data were used for the EU and Slovenia for the purposes of comparability; namely, EUROSTAT uses different calorific values. The data were obtained on EUROSTAT's website under the column »Environment and energy«. The data for the sector 100900 »Gross inland consumption« were used. The data are prepared on an annual basis, while the data for the previous year are available at the end of the current year. Data processing methodology: Average annual rate of growth of the total energy consumption is calculated as [(last year/base year) ^ (1/number of years) –1]*100. For the calculation of shares of individual fuels in the total energy consumption, the total energy consumption was the denominator and the use of individual fuel was the numerator. The indicator can be shown in relative (share of individual fuels in total energy consumption) or absolute units. For the indication in absolute units, the thousand tonnes of oil equivalent (ktoe) is used. The annual growth for the indicator is sometimes shown as a percentage point. A percentage point is a unit used for the comparison of different rates of growth. A percentage point includes an absolute comparison calculated by the formula (nthis year)–(nlast year)=16 %–15 %=1 pp (for instance: if last year the growth was 15 % and this year 16 %, then this year the growth was higher by 1 percentage point). The difference in growth can also be expressed as a relative comparison using the formula [(nthis year/nlast year)*100]–100=[(16 %/15 %)*100]–100=6.7 %, where the growth is indicated in percentages. Geographical coverage: The EU-15 includes old EU Member States (Austria, Belgium, Denmark, Finland, France, Germany, Greece, Ireland, Italy, Luxembourg, the Netherlands, Portugal, Spain, Sweden, the United Kingdom). The EU-10 includes members that joined the EU in 2004 (Cyprus, Czech Republic, Estonia, Hungary, Lithuania, Latvia, Malta, Poland, Slovenia, Slovakia). The EU-12 also includes, besides the EU-10, Romania and Bulgaria. The EU-27 includes EU-15 and EU-12; the EU-25 includes, on the other hand, the EU-15 and EU-10. - Advantages and disadvantages of the indicator: The source of the basic information is one institution (SORS, EUROSTAT) for the entire time series. This provides a more efficient analysis of events in the considered period. Reliability of the indicator (archival data): The reliability of data is estimated through the statistical differences in the energy balance due to the use of different calorific values. EUROSTAT uses the criterion that the energy balance is good if the statistical difference is smaller than 5 % of the energy consumption at the state level. In the used data, the statistical difference at the beginning of the period is 2.5 %, until 1999 around 1 %, and after that year lower than one percent. The unreliability of data is present especially due to the comparability over time, especially for the data on the use of renewable energy sources; namely, before 2000 these data were collected and processed by the ministry responsible for energy, and after 2000 by the Statistical Office of the Republic of Slovenia. There are not any official data on the energy consumption for the period 1992-1999 that would be directly comparable with the data for the period 2000-2008. In order to close in on such consistency as much as possible, the data were calculated on the basis of the data of SORS, which were communicated to EUROSTAT. Despite the fact that the data of the same institution were used, there were not any derogations in the comparison of calculations and official energy balances for the 2000-2007 period. Uncertainty of the indicator (scenarios/projections): Scenarios and projections are not available. - EEA, 2007. EN26 Total Energy Consumption by Fuel. - European Commission, 2006. COMMUNICATION FROM THE COMMISSION - Action Plan for Energy Efficiency: Realising the Potential (COM(2006)545).